Gilbane delivers efficient and cutting-edge solutions worldwide, including remote and austere locations. 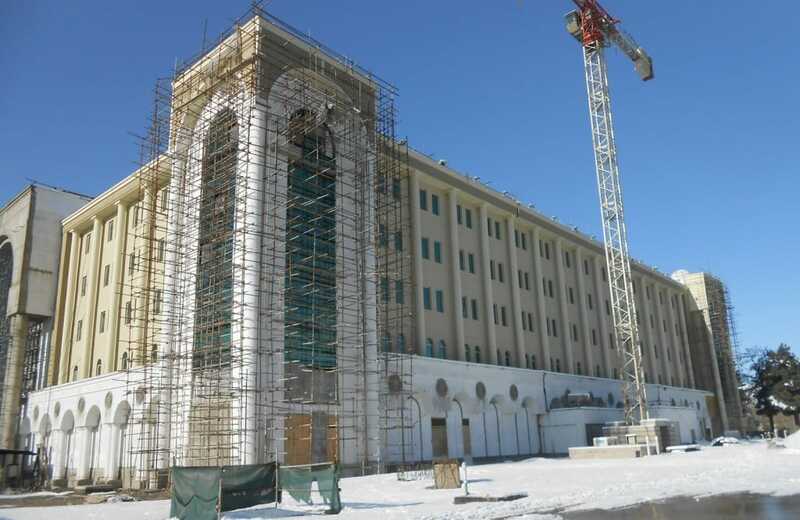 The newly constructed five-story, 121,332 square-foot Ministry of Defense (MoD) Headquarters Facility in Kabul, Afghanistan serves as a companion to the existing five-story, Soviet-era MoD building. The new headquarters consolidates MoD senior leadership and support staff offices located throughout Kabul. Located in a combat theater of operation, this project required Gilbane to manage complex logistics, safety, and security requirements. Our design team revised 35 percent design documents to make the construction effort more efficient. Revisions and value engineering efforts resulted in: (1) an increase in the facility’s net usable square meters, allowing for an increase in the occupant capacity; (2) foundation design revisions providing more efficient beam and column sizes; (3) vertical alignment and consolidation of the MEP systems; and (4) elevation of the ground-level slab to mitigate the possibility of water infiltration. Gilbane also developed an innovative HVAC value engineering concept. Rather than use a large central air handling unit as originally specified, we determined that distributed coolant systems with local radiators would distribute more efficiently and minimize start-up loads for the HVAC on the generator, reducing maintenance costs while providing more reliability operations. Construction of the building required extensive placement of structural concrete. To expedite work and ensure QC, Gilbane established an on-site concrete batch plant and an on-site concrete testing laboratory. Gilbane continually evaluated security conditions and material delivery schedules and selected the most secure, cost-effective, schedule-efficient travel route possible.